Woman Rejected By Airline Decides To Start Her Own Airline — And Does! Sibongile Sambo is an example that we should never give up on our dream. AFRICANGLOBE – When Sibongile Sambo, a 42-year old woman from South Africa, was told by South African Airways that she did not qualify for a flight attendant position because she did not meet their minimum height requirement, she decided to take matters into her own hands. 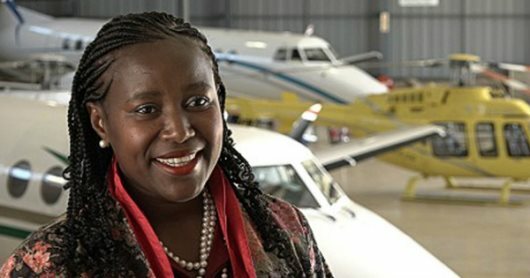 She became an entrepreneur, and started her very own airline called SRS Aviation, and until this day, her company is the only Black woman-owned and operated aviation company in Africa. Starting an airline is not an easy or cheap thing to do, but despite this, she was still able to get it off the ground. First, she formed her company and gave it the name of SRS Aviation. Then, she bid and won a contract for cargo transport issued by the South African government and formed a partnership with MCC Aviation – a South African-based fixed & rotor wing charter operator. Finally, she sold her car and cashed out her mother’s pension to help her obtain an Air Operating Certificate from the South African Civil Aviation Authority (CAA). It wasn’t an easy process, but she was able to raise the needed capital and make it work! Now, Sambo’s company offers their clients professional and personalized flight options to destinations in Africa and around the world. Their services include VIP charters, tourist charters, cargo charters, game count & capture, and helicopter services. Her customers pay anywhere from $1,000 USD to $200,000 USD per flight. Sambo’s vision is to be the number one choice in affordable air service solutions for individuals and businesses, locally and worldwide, by providing an unparalleled air service. She also aims to uphold the highest safety standards.